3. The “Setup” or “Open” dialog box has been redesigned and applied to all the tools, making it easier to understand the functions of each section and easier adoption. 4. An added list of “Recent” databases used makes it simpler for users to find the databases they access frequently. 5. 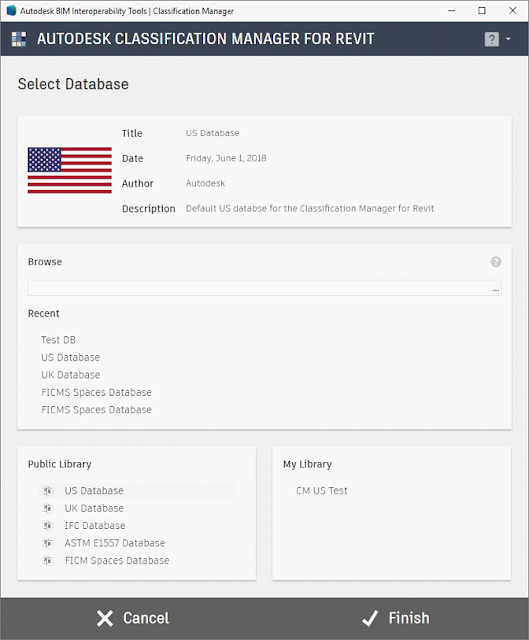 A “Public Library” points to a web-server hosted “standard” databases, managed by the BIM Interoperability Tools teams. This allows for easier and faster update of these databases. 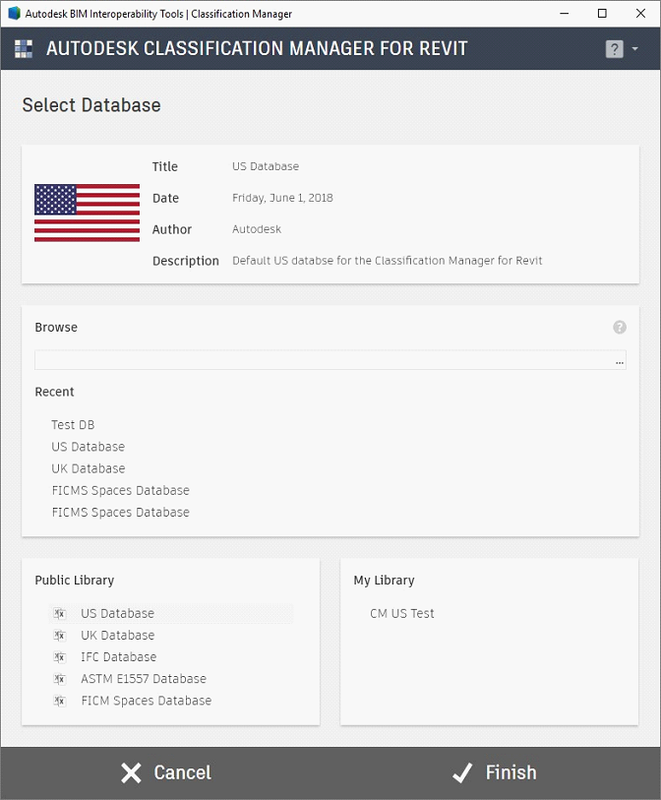 As soon as the file is updated, users get access to the new database. In previous versions of the Classification Manager, users had to download and install a new release of the software whenever a database was updated. 6. New consistent UI elements make navigating and using all the tools easier to understand across them. The Assign tool has realigned the original layout to match the new design scheme. 7. The Assign tool is now “non-modal”, which means it can be used in tandem with Revit and doesn’t need to be closed as users go back to working in Revit. 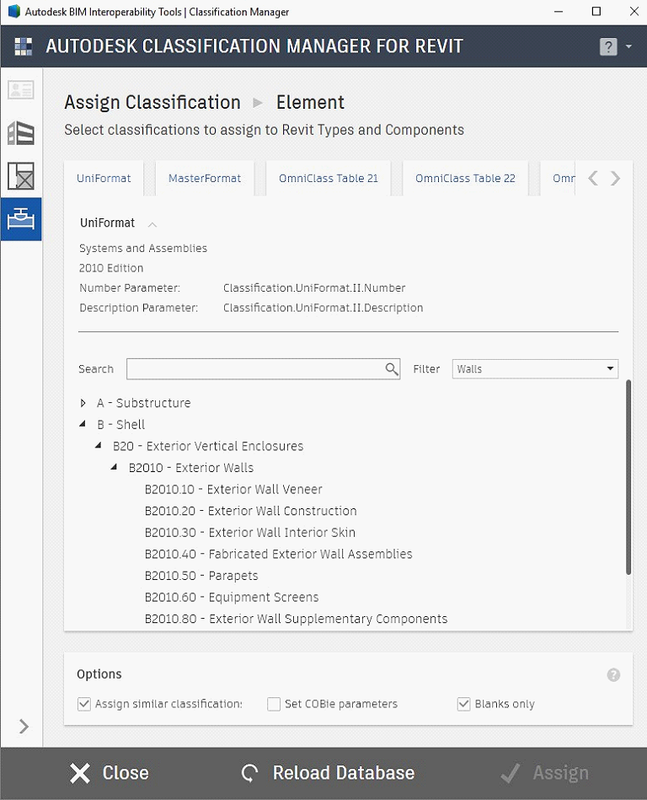 This will allow users to continue to leave the tool open and continue to assign classifications to selected elements. 8. Classification types (Contact, Facility, Space, Element) are now pages accessed through page index on the left-hand side, in line with navigation found in other Autodesk applications. 9. Each classification system per type is now a series of tabs along the top. 10. 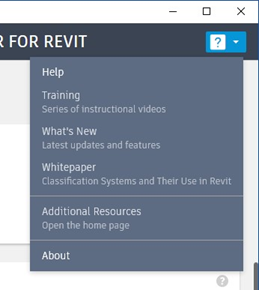 The Number and Description parameters being filled in are now shown in the UI, so users will immediately know what Revit parameter is being impacted. 11. Previous versions included a limit on how many systems each classification type can support, and this limit has been removed. Autodesk Classification Manager is brought to you by Autodesk. It's free.